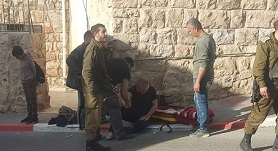 A Palestinian was injured, on Thursday morning, after being ran over by an Israeli settler in the Jaber neighborhood near the Ibrahimi Mosque in the southern occupied West Bank city of Hebron. Locals reported that an Israeli settler ran over a Palestinian worker, Jumaa Qufeisha, resulting in minor injuries before fleeing the area. The worker was immediately transferred to a hospital to receive medical treatment.